Chinese Rhenish Church by Index Architecture Ltd.
All things were made through him, and without him nothing was made that has been made. In him was life, and the life was the light of men. The light shines in the darkness, and the darkness has not overcome it. 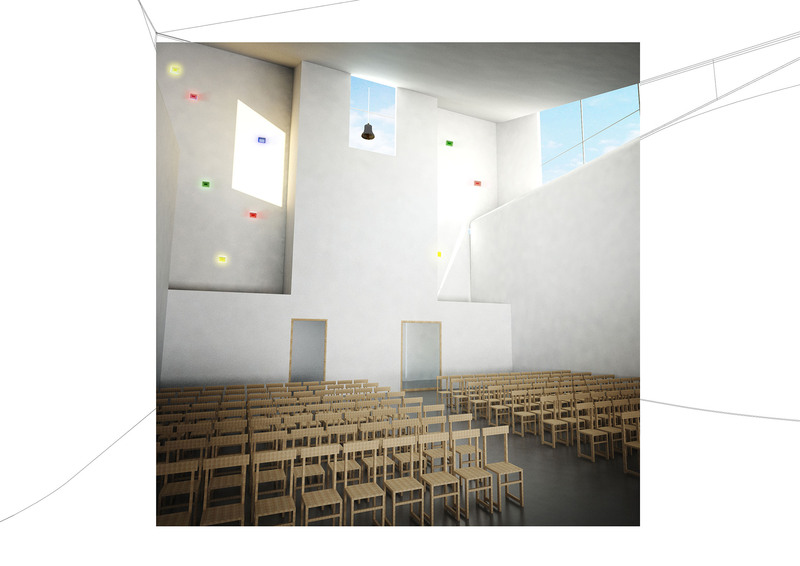 The concept of the design of Rhenish Church in Yuen Long is driven by the Power of Drama of Light. The church is oriented in the East-West axis to maximize the lighting drama to be experienced inside the sanctuary. Morning light from the east passes through the narrow vertical slot window, together with a horizontal wooden log made from a tree that once stood on the site, they form the Holy Cross. The log is lit from behind thus making the Cross shines in darkness. In later afternoon, lights filter through the stained-glass openings on the west wall. The West wall, which is also the highest point of the church, functions as the “Bell Tower”. With this siting of the church, it provides the opportunity of using a large open space within a tight building lot for various outdoor church activities. The building is a three-storey structure. The first tow floor layouts fulfill the daily functional and social activities of the church. The exterior tow floor is clad with granite to echo the surround single stone houses in this rural neighborhood, the white stucco exterior above provides a stark contrast to the stone base and defines the most sacred place, the Sanctuary. The Vaulted roof resulted in a triangulation which evokes the Trinity. It points towards the Cross to the east side. 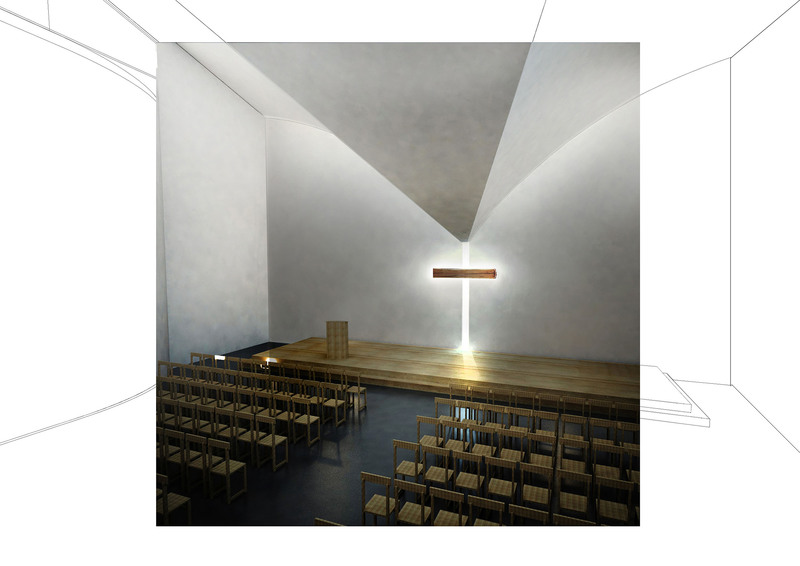 The vaulted ceiling acts as a giant light reflector to give ambient reflected light inside the Sanctuary. 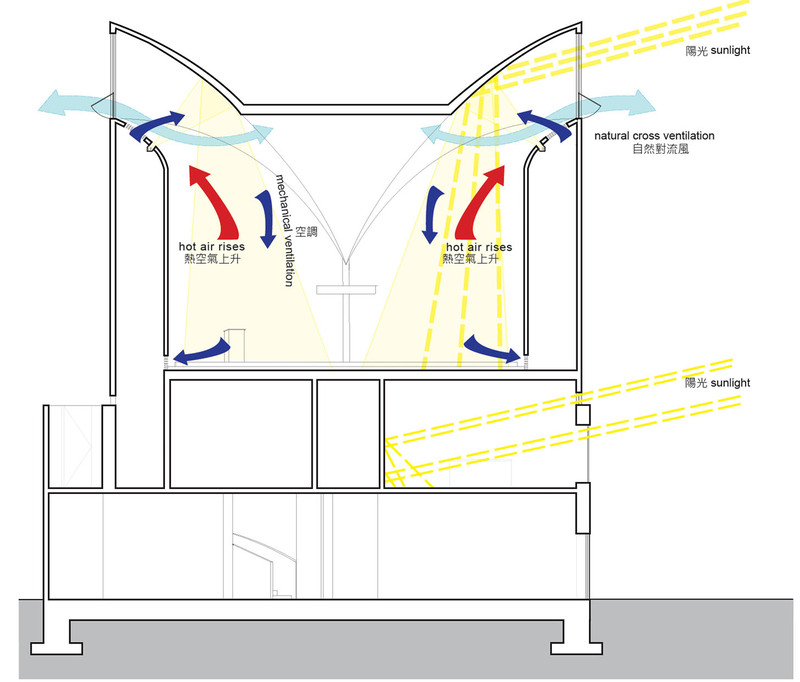 The slope and drainage of the roof allow the rainwater to be collected and redirected towards the scupper above slot window, forming a metaphysical connection between Nature, Light and the worshippers’ Spirits.